Yesterday I got a look at some decidedly old tech: Rope beds, pewter being made by hand, ceramic wood burning stoves, a bit of blacksmithing — all at Bethabara, which is a preserved 18th century village that had been established by German Moravians, who were the first settlers around these parts. Fascinating. The event was the annual Apple Fest, with plenty of local orchards offering every variety of apple imaginable, as well as about any kind of food prepared with apples. 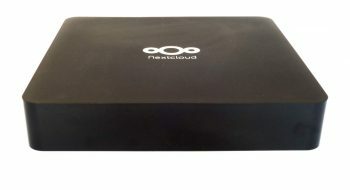 The Nextcloud Box is designed to be an easy way for consumers to use a Raspberry Pi for DIY cloud storage. The biggest story in FOSS this week was really something of a nonstory about Libreboot suddenly leaving the GNU project. We’ve already covered the initial story, as well as responses by both RMS and the FSF, so no need to flog this horse again. That reminds me, there was a horse at Apple Fest, along with lamas and sheep — all part of a portable petting zoo, which I’m guessing didn’t exist back when most people spoke either German or Cherokee around here. Nextcloud ups its game: Nextcloud, the recently forked version of ownCloud, has been busy trying to establish itself as the FOSS answer to Dropbox and Google Drive. Since June, when the fork occurred, the code has been cleaned up, new features have been added and work has begun to create new code to reintroduce functions of ownCloud’s proprietary enterprise plugins that were lost with free and open source replacements. That’s not all. This week, through a partnership between Canonical, Nextcloud, and WDLabs, saw the announcement of the Nextcloud Box. Due to be released in October, the box contains everything you’ll need to combine it with a Raspberry Pi to to create your own cloud storage. Included: a 1 TB USB3 hard drive from WDLabs; a microSD card with Snappy Ubuntu Core, Apache, MySQL and Nextcloud 10 pre-installed; a microUSB charger with cables, adapters, a screw driver and screws; and a Nextcloud case with room for the hard drive and your (not included) Raspberry Pi. It can all be your for $79. Pre-orders are being taken now. Law proposed to allow cities to build own Internet systems: The cable guys, whose mantra is “no regulation, let the market dictate” except when it isn’t, has been very successful in getting state governments to pass laws forbidding cities and towns from building their own publicly owned broadband systems. In 2015, the FCC jumped in to block such laws in North Carolina and Tennessee, and as you might guess the case ended up in court. Also as you might guess, the states — as well has private monopolies — won. This week, in a move that Ars Technica is calling a “long shot,” a Democratic congresswoman from California, Anna Eshoo, proposed legislation that would overule state law and allow municipalities to build their own Internet services regardless of the thinking of state legislators on the subject. Again, it’s a long shot — but a step in the right direction, IMO. Write your congressperson if you are so inclined. Another day, another distro: Tuesday saw the release of KaOS 2016.09, which gave the world its first peek at KDE Plasma 5.8 LTS Beta. Quick takes: On Tuesday, users of Vim awoke to find that their favorite text editor was due for an update, to Vim 8, the first update to the popular text editor in more than a decade. Evidently not to be outdone. on Saturday Emacs released version 25.1…. Cracker/hackers can get reasonably rich legally by finding new security holes in Android, now that Google has offered a new $200,000 hack challenge…. And I don’t like to be nice to Oracle, but I do like to be fair: This week the media was deep in Oracle’s do-do over an “unpatched” MySQL security problem. Trouble was, Oracle had patched the hole a week earlier. Oops, said tech reporters everywhere. Parting shot: I think you’ll love this blast from yesteryear that Jon “maddog” Hall found and linked-to on Facebook. It’s an excerpt from a 1984 BBC tech program showing how to use email. Christine where can I get one of those “ceramic word burning stoves”? @tracyanne — they don’t make them any more. Remember the restored village was from the time when writing about open source was forbidden. @tracyanne Yup. Ed’s right. The two that I saw were built in 1788, and we weren’t allowed to touch them because of their age. 18th century Moravian potters in Bethabara and Salem, NC were required by the community to be able to make them, as they were the most efficient method of heating known at the time, at least in the German communities around here. Looking at them you could see that they would be very efficient and supply good heat, much better than the fireplaces used by the English at the time, or the cast iron wood stoves the English used later on. @Christine Uncle Ed. I guess the words we use these day are the wrong sort too, being English rather than German, so they wouldn’t burn them properly either. I thought German’s tended to burn Jewish words, as well as their creators. Any links to what a ceramic word looks like? @Randal, Ken is still with us. If you’ve known him a while, you know he has some serious health problems and they take him out of circulation once in a while. He’s on the mend again and will probably be back with us before too long. @tracyanne @UncleEd Oops… or Aha! I finally see that you’re trying to point out a typo to me. Corrected. Thanks.